This double wall vacuum insulated water bottle keeps drinks cold for up to 24 hours and hot for up to 12 hours! It's a 25 oz. premium grade stainless Steel BPA free sports bottle with a high quality colorful powder-coated matte finish exterior that does not sweat. Your employees and clients will thank you for keeping them hydrated on-the-go and in the office. - Double-walled construction keeps contents hot for 12 hrs. and cold for 24 hrs. Click here to be notified by email when Stainless Steel Water Bottle becomes available. An estimated 767 million people live below the international poverty line of $1.90 a day. 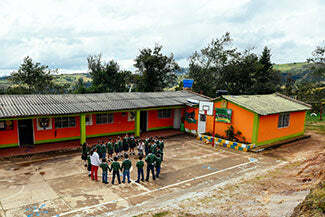 Cotopaxi, a Benefit Corporation, is focused on addressing the root causes of extreme poverty. They provide targeted grants to nonprofits addressing health, education, and livelihoods programs. Cotopaxi also structures its product design, development, and supply chain operations, to decrease environmental impact (using remnant fabrics that would otherwise be discarded) and increase social impact (ensuring factories provide fair and sustainable working conditions). Your purchase today helps end extreme poverty tomorrow.